Uniting Church members lay and ordained joined their sisters and brothers of the Christian, Jewish and Muslim faiths at the annual Abraham conference at Parramatta Mission in Sydney on Sunday 16 July. The event was co-hosted by the UCA Synod of NSW & the ACT, Affinity Intercultural Foundation, the NSW Jewish Board of Deputies, the Australian Egyptian Forum Council and the Columban Centre for Christian-Muslim Relations. 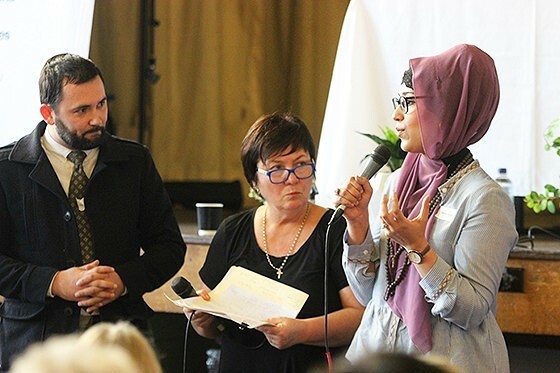 Former ABC presenter and South Sydney Uniting Church elder Julie McCrossin emceed a lively panel discussion which included many contributions from the floor by a range of people engaged in interfaith work across Sydney. As in all serious interfaith gatherings, hospitality in the form of refreshments and snacks were offered to encourage the conversations, graciously served by congregation members at Parramatta Mission. The panel included Josephite Sister Maria Sullivan, family lawyer and Islamic studies graduate Tamana Daqiq and Rabbi Yossi Friedman of the Maroubra Synagogue. All spoke of the lessons they had learned working across faiths and cultures. Read more and browse image gallery.